Home Blog Scotland to ban fracking! 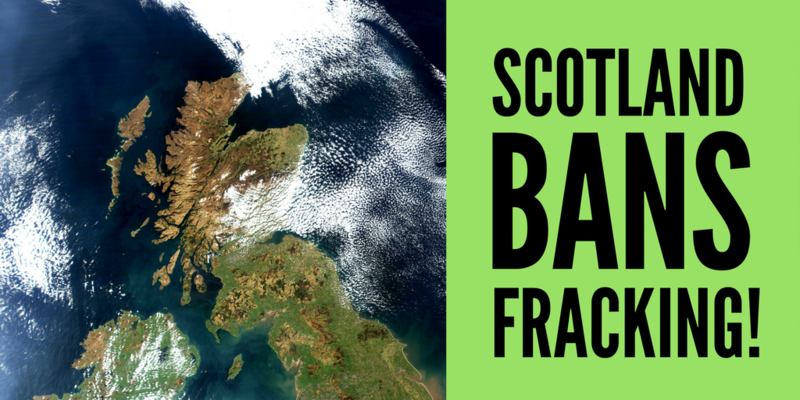 The Scottish Government has today announced that it will ban fracking for good, after nearly three years of a moratorium on the controversial industry! Today’s decision is a truly momentous win for the anti-fracking movement, as Scotland joins the ever-growing list of states and regions to outlaw the industry. It will be met with celebration and relief across the country, particularly by those on the frontline of fracking here in Scotland who have been working for a ban these last 6 years. It will also be met with cheers around the world, in the many countries and communities who have supported our struggle, many of whom are still fighting their own. In his statement to Parliament this afternoon Energy Minister Paul Wheelhouse said that the existing moratorium would be extended indefinitely using planning and environmental regulation powers to effectively ban the fracking industry. It fell short of committing to passing a law like recent bans in Ireland, Victoria and Maryland, when powers over onshore oil and gas licensing are finally handed over by Westminster. The measures announced today are the right interim approach, however we will be pushing them to go further and pass a law as soon as licensing powers are technically transferred to Holyrood. Over 60,000 people responded to the Scottish Government’s consultation on fracking, the second largest number to engage in a consultation in the history of the devolved Parliament, with 99% calling for a ban. This is the largest number of people ever to express a single opinion to a Scottish Government official consultation. The Scottish Government has promised it will let Parliament debate and vote on its decision. This will likely take place in the weeks after Autumn recess. The Labour Party, Greens and Liberal Democrats are all opposed to fracking and therefore highly likely to support the Scottish Government’s decision. We are urging everyone to contact their MSPs to now to ask them to push the Government to go further and take the final step by passing a law banning fracking. See our interactive timeline below for a short history of how the ban was won! Thanks to everyone who helped make this campaign possible whether you were contacting MSPs, responding to the public consultation or sharing information on social media.